The game features a similar cast to KOF '94 with the exception of the USA Team, which was replaced by the Rival Team. 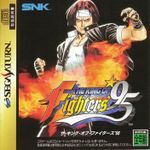 The plot features a new King of Fighters tournament once again promoted by the criminal Rugal Bernstein, who wants to take revenge against Kyo Kusanagi, who defeated him in last year's tournament. The game also introduces a sub-boss character, Saisyu Kusanagi, who is the father of Kyo. 'KOF '95' also introduces the fighter Iori Yagami, who becomes Kyo's rival in the series. One of the main focuses in the creation of The King of Fighters '95 was the introduction of the Rivals Team, most notably Iori, who became one of the favourite characters from the staff. The game has received mixed reviews from various video games publications. Most writers have complained about the response from controls and long loading times from the PlayStation port. However, the introduction from the enhanced version of Rugal, Omega Rugal, as well as the differences between all the characters have been noted to be one of the best parts from the game. The gameplay and rules are mostly unchanged from The King of Fighters '94. The main addition is the introduction of the Team Edit feature, allowing the player to create a custom team from any of the game's 24 characters in addition to the pre-defined teams in the game. Through the main play mode, players must defeat all of the teams from the game in order to fight the bosses: the brainwashed Saisyu Kusanagi, followed by a stronger Rugal Bernstein. Source: Wikipedia, The King of Fighters %2795 , available under the CC-BY-SA License.